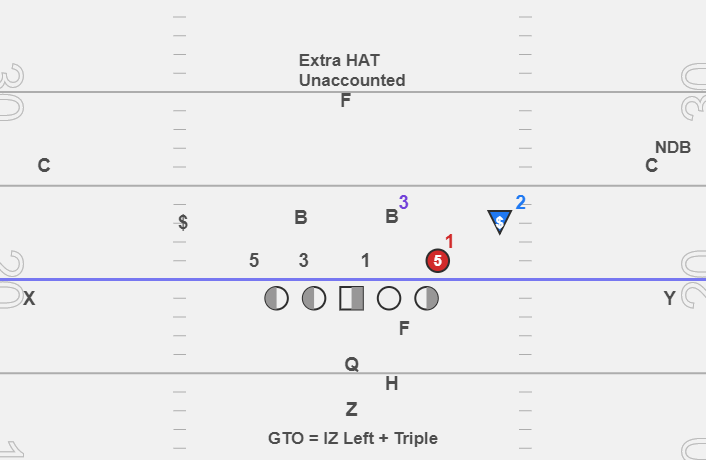 This article will help you guys out there wanting to install a basic Gun Triple Option (GTO) offense much like you see Georgia Southern, Tulane & New Mexico running over the last several years. My team evolved from the flexbone to the GTO, so I have developed my own terminology, and I will share it with you throughout this article. We exclusively ran the GTO at the high school level in 2017. I want to first discuss with you of the major differences between under center (UC) flexbone triple option and the GTO. •Snap - We snap the ball from the Shotgun instead of Under Center (UC). •Personnel Group (Pkg.) – We use an 11 pkg. instead of 30 pkg. •OL scheme – we use an inside zone blocking scheme instead of a veer scheme for the dive. •Read – We use a backside read instead of a frontside read. 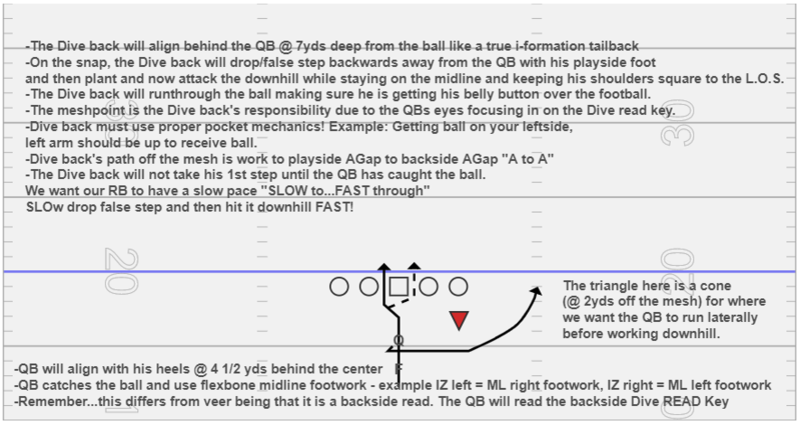 •Perimeter – Since we have a Give (RB zone) side & Keep (QB Pull) side, there is not a designated playside & backside. Both WRs to either side of the formation/play base rules are run-off/stalk. #3 – The “RUN SUPPORT” DEFENDER from the secondary (either the safety or corner) is whoever HAS PITCH/FLAT RESPONSIBILITY. If both defenders play run support we need to pass b/c there is no defender playing the deep pass zone. N.D.B.- NEAR DEEP BACK- Secondary player responsible for the deep pass coverage. There are only 2 types of mesh points you will need to practice in order to run the GTO. H –Man & Z –Man: This is our slotbacks you want catching the pitch on the perimeter on the 3rd phase or running the rocket toss/Jet sweep. It can be a smaller & faster type of player or another tailback/Bback type kid. These players will handle the ARC/LOAD blocking on the perimeter for triple option. F –Man: Traditional blocking FB/H-Back/Sniffer/TE – Many folks consider this player a detached TE. He will have the role of ARC/LOAD perimeter blocking on GTO. Z –Man: This player is our slotback you want catching the pitch on the perimeter on the 3rd phase of GTO. It can be a smaller & faster type of player or another tailback/Bback type kid. We use Mnemonic devices to help aid our players to memorize quickly where they align right or left based on the name of the formation. Example: BLack, BLue & YeLLow & Glock all have an “L” in the name, so the F-Man knows he will align on the left side. BRown, GReen, Red & Ruger all have an “R” in the name telling the F-Man to align on the right side. Z-Man alignment rule for any 2 BACK formation suffixed with the word “STACK” is to align directly behind the QB as the deepest pistol back. Timing up the 4x1 pitch relationship of the Z-Man & QB when the Z-Man is Stacked in the pistol may require the Z-Man to take a 2 step counter fake opposite of the way he will be going before goes to get into pitch relationship so he isn’t way ahead and outside of the QB. Our next blog post will continue with option concepts from gun alignments. 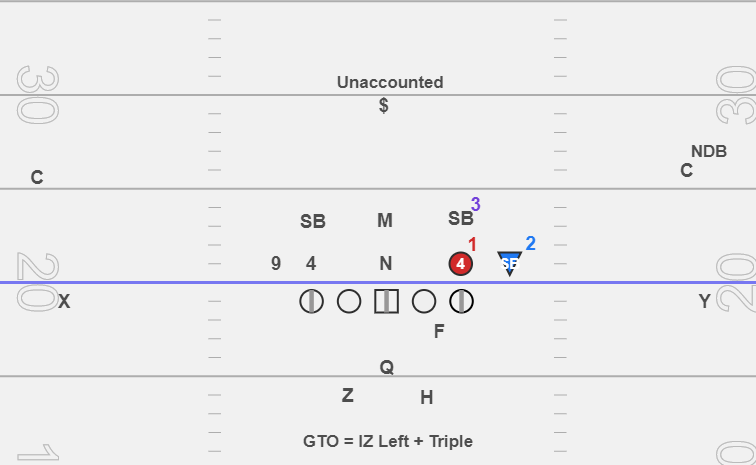 We are excited to have a guest blog by Mark Grounds, the head football coach at Jacksonville High School in IL, discussing gun split back veer option concepts. As always feel free to discuss blog posts or ask questions on our forum page located here: http://flexbonenation.proboards.com/ If you have any questions please feel free to contact me on twitter @runthetriple or @themeshpoint or @flexbonenation and my email address is lafayettefootball1@gmail.com.